Having opened its doors a mere three weeks ago, this trendy little café is definitely making waves with the locals; and it’s easy to see why. With its milk crate stools, reclaimed wood floors and custom graffiti style artwork adorning bare brick walls, Gasolina brings a taste of that contemporary, raw inner-city vibe to the suburbs of Sydney’s south. While the café is tiny, it certainly packs a lot of character. While seating inside the tiny corner café is scarce, there are a number of tables outside that enjoy the warm autumn sunshine. 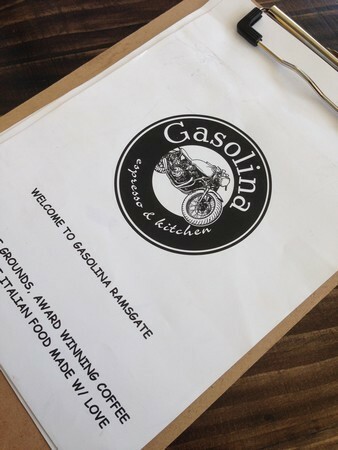 However, Gasolina is located along a very busy road, meaning that the setting is not what one would call peaceful; although the delicious food, friendly service and relaxed, unpretentious atmosphere go a long way towards making up for the trucks that go roaring up and down the street. 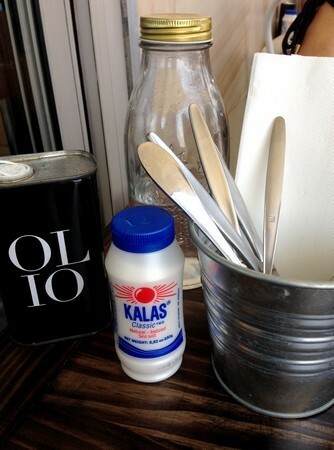 Tables are adorned with Italian extra virgin olive oil, Greek sea salt and recycled glass water bottles. Gasolina serves up an all day breakfast, as well as a selection of paninis, salads and burgers, all with a strong Italian influence. Breakfast, which is served until 3pm, includes an abundant assortment of eggs, breads and mueslis. The Florentine panini ($12); two lightly fried eggs, tender baby spinach and crisp, salty bacon all topped with rich, buttery hollandaise sauce and encased in luscious sourdough, and the Italian breakfast board ($18); gooey, poached eggs, San Daniele prosciutto, Persian feta, avocado, marinated olives and fresh sourdough combine the best fresh, seasonal Australian produce with Gasolina’s distinct Italian flair. 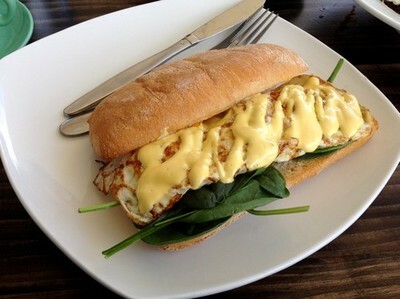 The Florentine breakfast panini, smothered in buttery hollandaise sauce. For lunch, there is a quintessentially Mediterranean feel to the small, yet well rounded menu with a selection of sandwiches, salads and burgers; of which arrive on a wooden board with crisp beer battered chips. 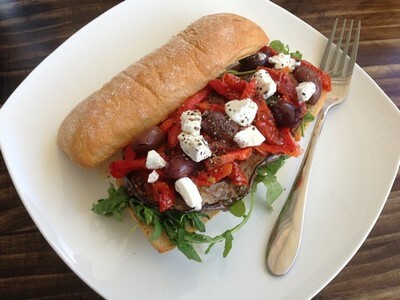 The vegitariano panini ($12) proves that vegetarian food need not be dull by balancing the big flavours of salty Ligurian olives with sharp feta cheese, sweet sun dried tomatoes, and vibrant grilled red capsicum. While the flavours are definitely all there, a little green salad with a drizzle of that glorious golden olive oil would do wonders to rounding out this otherwise perfect light lunch. If carbohydrates are not your friend, Gasolina also serves up a selection of six Mediterranean inspired salads including a traditional Caprese salad ($12); a salmon salad with briny capers ($16), and the minute steak salad ($16) which combines tender strips of lightly grilled steak abed a mountain of fruity Roma tomatoes, Spanish onion, marinated feta, and a tangy balsamic vinegar and extra virgin olive oil dressing. Gasolina also acts as a deli, supplying choice imported Italian products, including dulce de leche peanut butter; crema di noci; a sweet walnut paste; decadent white truffle oil; golden extra virgin olio d’oliva; plump Ligurian black olives, and a selection of sauces, salsas and pastes. 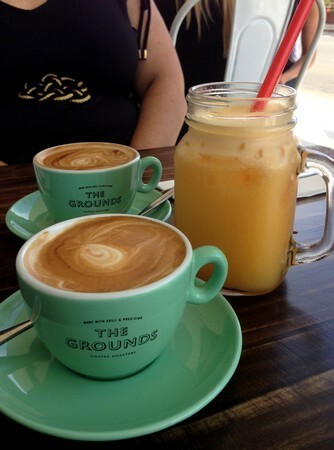 The delicious coffee at Gasolina comes courtesy of The Grounds, while cold drinks are served in very cool mason jar mugs. The single origin coffee served at Gasolina can also be purchased to take home, and comes courtesy of The Grounds who roast right here in Sydney, and specialise in selecting beans based on quality and seasonality. The seasonal blend currently served at Gasolina is rich, with a slight woody note, and acts as the perfect accompaniment to the Italian inspired pastries on offer. 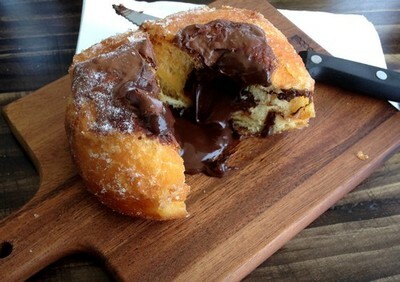 The Nutella doughnut is one such pastry, and has quickly become a crowd favourite at Gasolina. The fluffy doughnut batter, with just a hint of citrus zest to quell the impending sucrose overload is lightly fried till golden brown, liberally rolled in granulated sugar, and injected with decadent Nutella. Needless to say, if you’re a fan of Nutella, these little beauties are a must have. Fried dough, coated in sugar and injected with Nutella - the ultimate chocolate doughnut. While Gasolina has been open for only a matter of weeks - as at the time of writing this; it is easy to see why it has quickly become popular with the locals. The food is fresh and vibrant; the service is friendly and efficient, and the décor is contemporary and exciting - successfully adding a little inner-city swank to the suburbs, without becoming pretentious. Where: 1/226 Rocky Point Road Ramsgate NSW. Why: Great atmosphere, delicious meals and decadent Nutella doughnuts. Cost: Breakfast from $5 - $18. 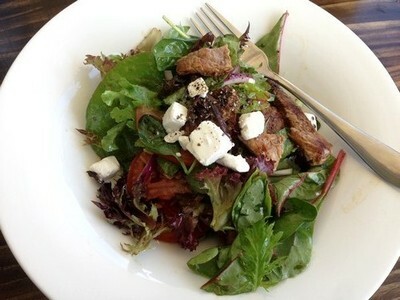 Lunch from $12 - $18. Coffee, frappés and cold drinks from $3.50 - $7. When: Open everyday from 7am - 4pm. Good for kids: Not really. There is very little space, and the café is located along a very busy street. 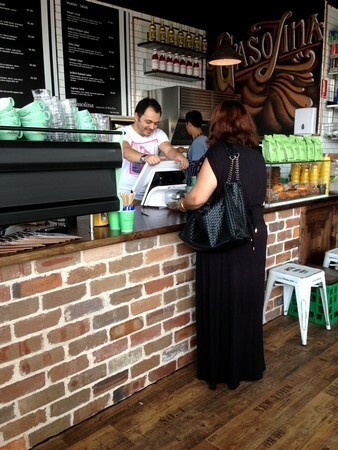 Take away: Yes, meals, coffee and pastries are all available to take away.